Hopefully some information to share. 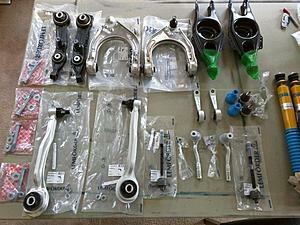 The suspension pieces I am replacing will arrive tomorrow. I also have posted the complete parts list elsewhere on this forum, but I will find it and make sure it gets organized properly on this thread. This is the pss9 kit for an w211. I will find the spring rates and post them. This is the link to the parts list I am working from. There may be a bit of double-up as the upper ball joints also come WITH the upper arms depending on what you order. I found that the non-e55 upper arms are cheaper, as I assume the E55 arms have some attachment for the sensors, which the coilover process will no longer need. Subscribed for what I know will be a wealth of info! I am Also not yet in possession of the spring spacers "shims"
Complete rebuild! Very nice . I'll do this on any system that comes up before regular maintanance. I did it with the oil lines and coolant lines. All new. Fuel senders and pumps as well, but that is more complex, obviously. Waiting for word on the upper arms, the Shims and of course shardul's rear camber/toe pieces. 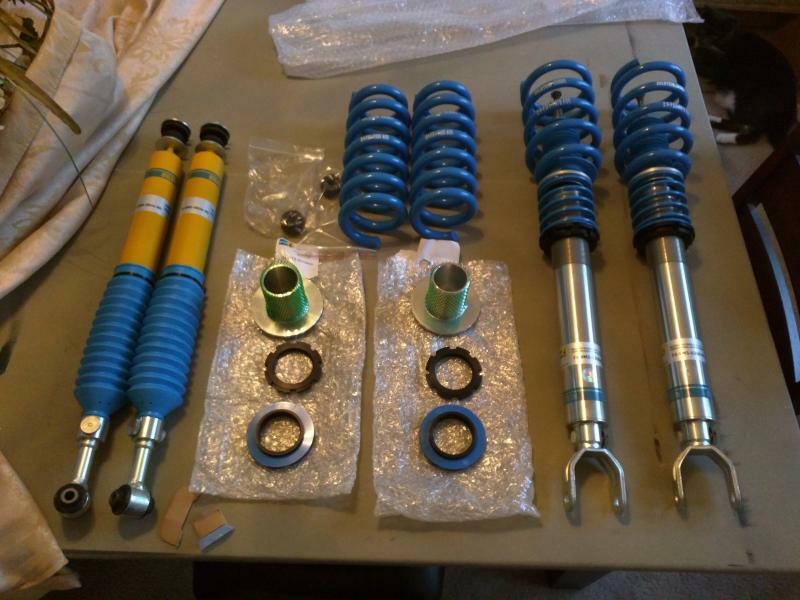 What is the individual part number on the rear shocks from the coil over kit? Subscribed. Would love to hear about the ride quality and handling once this is done! Let us know when you are ready for the suspension kit to top out our build and it will go out same day. Again, lot of pretty parts you are adding. Your E should look like a show car with all the new shiny metal. Hi, shardul's last pm says they will be here Monday! So with the toe and camber link arms from shardul, I am still expecting the Strut mounts for the top of the front and the spring seat "shims" that should the springs at the back. Oh coming from Texas. I will be keeping my arnott airmatic setup as I got it handling decent with a proper front wheel alignment. What caught my eye about this is these are proper bilstein shocks. Looks really nice keen to hear how it handles on those. The bilstein pss9 setup was just over 1800. So with all these suspension parts, I'm at about 4k. I'm looking to 2015 being about at-will mods instead of forced-hand preventative maintenance. Impressive to see that kind of coin being spent on the suspension side of an E55, and not the drag strip side. Happy boxing day. Are you DVC from Rennlist? To answer your question - Of course. I'm not doing this to attain something I want that the platform cannot do. I didn't buy a w211 when I should have bought a BMW. I have driven an M5, which would have been cheaper, and it just doesn't do it for me, and this car was "technically" for my wife ( "Family car") and she hates BMWs for some reason. I have also seen what bmw calls a sport suspension, so I know I'm not missing much. I am doing preventative and needed maintenance on suspension wear items. This is basic stuff, just unfortunately expensive on this car compared to domestic or Japanese. I get into people's cars all the time that need these basic parts. Whether I feel like an *** determines whether I tell them what is wrong at what corner. Call me an automotive rainman. "Def, Def Definitively need new front tie rods and ball joints, definitively"
Somewhere along the way, people started to either forget that the suspension is a wear part, or somehow were made to believe it didn't need maintenance and replacement until it breaks. The coilovers are to make sure the car can take a trip with my family and not be stranded 1000s of miles away for some stupid balloon popping that should have been designed better. The parts I am concerned about now are the inner side front sway bar bushings,and whether I need to plan for wheel bearings. I am thinking the latter is important at this mileage. Interestingly, I made a thread about WYAIT items for the top of the engine. Seals, hoses, etc - and people were like "If its not broke - don't fix it" - and honestly I was completely surprised by the attitude on that. Preventative maintenance is so these things don't come up when you don't expect it. I hope many people are not treating the cars like this. Last edited by BC928; 12-26-2014 at 12:02 PM. Now this a build. I love builds like this, lots of attention to detail and very extensive. You will basically have a brand new suspension system. The car should handle very well after this. I wish I had the time and money to do this Why didn't you go with the KWs? Great point about the components being worn, and those being a good portion of your expense! I spent the last 10 years DD'ing P-cars with PS9s and KW V3s, and love that connection to the road. Still, I enjoy greatly the benefits of Airmatic, and its ability to make ****ty roads so much more comfortable. Lost an original bag on the road. Car was still driveable, so I personally don't worry now. I definitely could imagine how someone would worry though. Looking forward to your conversion progress, sir! 3) The bilsteins are adjustable (as are the KWs) but I feel as though from what was able to read there is more range. 4) I like Bilstein.. You may need to chalk this one up as "Personal Preference"
Did you know KW is OEM stock for one of the black series cars? And its a V3 instead of a V2, but you can't really GET the V3s for our car unless its 1000s more through the dealer? I lost the front passenger bag (See thread "Stop, Car too low" ) about 20 miles from the house. I was able to get it home fine - probably went way too fast for having no suspension! But if that happens, say, on our way to NorCal or Houston, and I am in West texas with my family - what then? Straight to a Stealership? I feel its win win, and I picked the PSS9 to at least think about softening it up if there is harshness. The roads in SoCal can be bad or good, depending on area funding. I guess we will see. I personally found the airmatic to be really harsh on all E55s I drove, and the jouncy uncontrolled feeling irritating. I spent the last 10 years DD'ing P-cars with PS9s and KW V3s, and love that connection to the road. 928s are normally on Bilsteins, but most recent p-car build has Konis - we'll see I guess. Last edited by BC928; 12-26-2014 at 12:51 PM. Interested to see how you like the Konis. Heard good things. I found the V3s to have a slightly improved ride quality over the PS9s, but the PS9s were more durable. Also, KW wanted me to send one of the units back before they would service it under warranty. This is a PIA when it's your DD and you've already tossed the stock strut! I believe the KW's use Koni sourced shocks. Have heard nothing but good things about both the PSS9' and the KW's for e39 M5 and Z4 M applications and will be interested in your feedback on the ride quality and control of the W211.